You’ve probably already had enough turkey by now but tuck this recipe away for the next time you crave it but just don’t want to roast a whole bird. Especially after Thanksgiving, some stores offer big sales on “turkey parts,” which you can store in the freezer until you are ready. Braising dark turkey meat in cider will give you a fall-off-bone tender morsels. 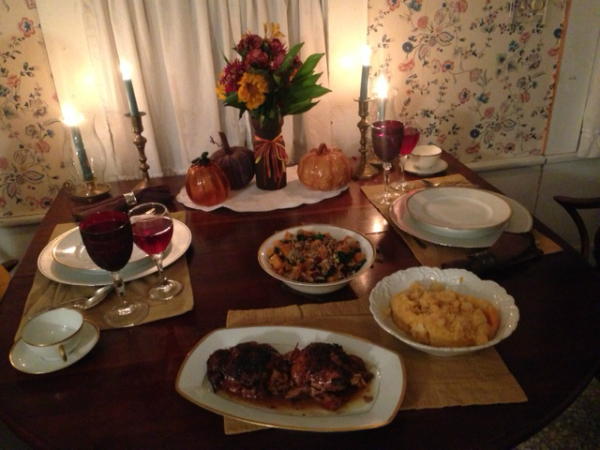 For various reasons, it was just Thanksgiving for Two this year. I packed up a big canvas bag with groceries and headed down to my mom’s house on Cape Cod to cook up the holiday meal. Usually for Thanksgiving I’m a welcomed and grateful guest assigned to bring some kind of side dish and often banished from the kitchen so the cooks of the house can swirl between the stove and kitchen without too much obstruction. So I actually relished the challenge to pull together a meal on my own, with an assist from Mom. 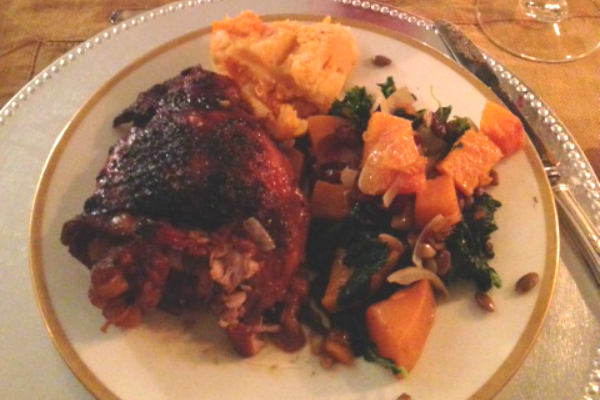 I didn’t want to cook up a whole turkey so this recipe for cider-braised turkey thighs that The Gourmand Mom had posted a few years ago seemed like the perfect solution. We also cooked up roasted butternut squash with kale and did a mash of white and sweet potatoes with chocolate pecan pie for dessert. Even without stuffing or rolls, that was really enough! 2. Pat the thighs and drumsticks dry with a paper towel. Season with salt and pepper. Sprinkle the flour over the thighs and drumsticks. 3. In a large dutch oven pan, cook bacon over medium/medium-high heat until crispy. Use a slotted spoon to remove the bacon, leaving the bacon drippings in the pan. 4. Place the thighs and drumsticks in the pan in a single layer, skin side down. Cook for 4-5 minutes, until the skin is nicely browned. Then flip the pieces and cook for about three minutes on the other side. Pour the cider and chicken broth over the chicken. (The liquids should come about halfway up the sides of the turkey, leaving the browned skin exposed.) Return the bacon to the pan. 5. Cover and place on the middle oven rack. Allow to cook for 90 minutes, undisturbed. Then, remove the cover and allow it to cook for 30 minutes more (to crisp up the skin and allow the sauce to reduce). Remove from the oven. Remove the turkey pieces and place on a platter. Pour the sauce into a measuring cup and allow it to cool for a few minutes (discard the bacon). As it cools, the excess fat will rise to the surface. Use a spoon to remove the excess fat. Then, taste the sauce and adjust the seasoning with salt and pepper, as desired.